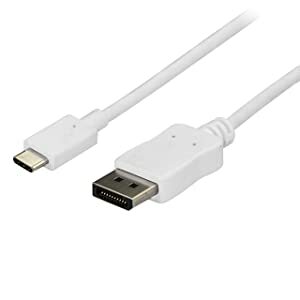 This USB-C to DisplayPort cable offers a convenient solution for directly connecting your DisplayPort over USB Type-C device to your DisplayPort monitor or projector, at up to 1.8 m (6 ft.) away. The adapter works with USB-C devices that support DP Alt Mode, such as the MacBook, ChromeBook Pixel and Dell XPS models 15 and 13. It's also compatible with Thunderbolt 3 ports. 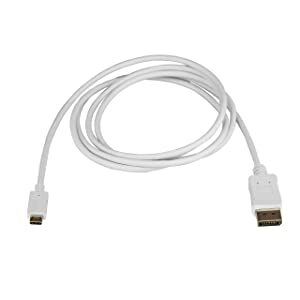 Seamless, clutter-free installation with your MacBook or HP ENVY At 6 ft. (1.8 m) in length, this DisplayPort cable delivers a compact connection that eliminates excess adapters and cabling, ensuring a tidy, professional installation. Plus, the USB-C cable's all-white design makes it an attractive accessory for your HP ENVY or MacBook with USB-C. While the adapter looks great next to computers like your Mac and HP ENVY, it works with any USB-C computer that supports DisplayPort Alt Mode, such as your Dell XPS, Ultrabook or other Windows laptop. Hassle-free connection with USB Type-C The adapter cable is easy to connect, through the versatility and convenience of the USB Type-C port on your device. USB-C is a reversible connector, so it doesn't matter which way you plug it in, the adapter will always connect, saving you the frustration of trying to insert it correctly when you're docking your computer to your workstation or office hot desk. Astonishing picture quality at 4K 60Hz At four times the resolution of high-definition 1080p, you'll be amazed at the picture quality of a 4K 60Hz monitor or television. This adapter cable lets you harness the video capabilities that are built into your USB Type-C connection, to deliver the astonishing quality of Ultra HD to your 4K display. Plus, the adapter is still compatible with lower resolution displays, such as 1080p, which makes it a great accessory for your current home, office or other HD work environment, while future-proofing for 4K 60Hz implementation. The CDP2DPMM6W is backed by a 2-year StarTech.com warranty and free lifetime technical support. The adapter is backward compatible with 1080p displays, which makes it a great accessory for home, office or other work environments. At 6 ft. (1.8 m) in length, this monitor cable eliminates the need for excess adapters and cabling, ensuring a tidy, professional installation. The 1 meter cable worked right out of the package between my late 2016 15" Macbook Pro with the 460 graphics upgrade and my Wasabi Mango UHD430 43" monitor at 3840 x 2160 resolution at 60 frames per second. I just plugged it in, the Macbook recognized the monitor and the desktop image appeared. Picture was crisp and video looked good. No complaints. I had lots of trouble trying to get HDMI to work using Apple's dongle, but this USB-C to DisplayPort cable just worked without any dongle. I recommend this configuration if your monitor has a DisplayPort input. Works great with MacBook Pro 15" (2016) and LG UltraWide monitor. Runs at 3440x1400 @ 60 Hz on my MacBook Pro (running macOS 10.12.3). So far so good. I just got a MacBook Pro 2016 with touch bar and needed this cable to get 4k 60fps on my Dell P2751Q. I have been using it for a few hours and the cable has been working great. 4K content on Youtube shows great. I will update the review if I experience any problems. 5.0 out of 5 starsReally worked!!!! My laptop dont have any DP. So i used my USB Type C port of my Acer V Nitro to my Acer X24 144hz 1ms monitor. Definitely working! Thanks startech for this! Now my CSGO gaming is far more better than my 60hz monitor.